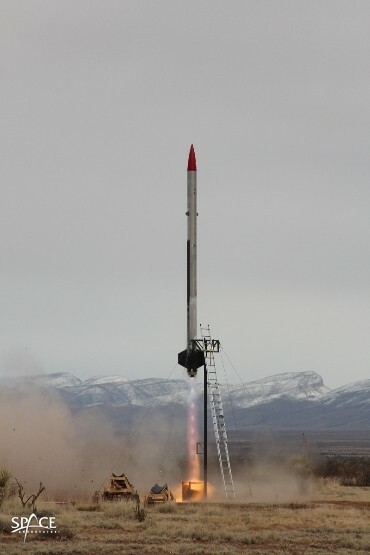 Upham, NM — New Mexico Spaceport Authority (NMSA) officials announced today a successful launch over the weekend of an advanced sounding rocket designed and built by Armadillo Aerospace. The launch took place from Spaceport America’s vertical launch complex on Sun., Dec. 4. The test flight was a non-public, unpublished event at the request of Armadillo Aerospace, as the company is testing proprietary advanced launch technologies. Saturday’s Armadillo launch successfully lifted off at approximately 11:00 a.m. (MST), which was within the dedicated, five-hour launch window, and reached its projected sub-orbital altitude of 137,500 feet (41.91 km). Armadillo Aerospace is a leading developer of reusable rocket-powered vehicles and plans to provide a platform for civilian access to suborbital space via its partnership with Space Adventures, Ltd.
“Spaceport America has been an ideal launch facility for this kind of vehicle R&D testing activity,” said John Carmack, President and CTO of Armadillo Aerospace. The vehicle housed a scientific payload as well. The experiment was designed, built, tested, integrated, and performed by a team of undergraduate students at the School of Aeronautics and Astronautics in the College of Engineering at Purdue University. The experiment studied a liquid and gas flow process that is sensitive to the gravity and acceleration levels encountered during spaceflight. The latest launch represents yet another successful experience at Spaceport America, the nation’s first purpose-built commercial spaceport. “We are extremely pleased to support Armadillo Aerospace as they conduct their high altitude vehicle flight testing, and look forward to hosting their NASA-funded suborbital research launches. Spaceport America continues to set the precedent for safe, efficient, effective service for commercial spaceflight customers,” said NMSA Executive Director Christine Anderson. This Armadillo Aerospace launch marks the thirteenth vertical launch test from the Spaceport America Vertical Launch Complex since 2006. Founded in 2000, Armadillo Aerospace has an unequaled experience base with over 200 flight tests spread over a dozen different vehicles. The company has done work for NASA and the United States Air Force, and flown vehicles at every X-Prize Cup and Northrup Grumman Lunar Lander Challenge event, including those held in New Mexico from 2006 to 2008. For more information, please visit www.armadilloaerospace.com. Space Adventures, the company that organized the flights for the world’s first private space explorers, is headquartered in Vienna, Va. with an office in Moscow. It offers a variety of programs such as the availability today for spaceflight missions to the International Space Station and around the moon, Zero-Gravity flights, cosmonaut training, spaceflight qualification programs and reservations on future suborbital spacecraft. For more information, please visit www.spaceadventures.com. Spaceport America has been providing commercial launch services since 2006. Phase One of the construction for the spaceport is expected to be complete in early 2012. Phase Two of the construction and pre-operations activities will follow, including the development of a world-class Visitor Experience for students, tourists and space launch customers. Officials at Spaceport America have been working closely with entrepreneurial space leaders like Armadillo Aerospace, Virgin Galactic, and UP Aerospace, as well as established aerospace firms like Lockheed Martin, Boeing, and MOOG-FTS to develop commercial spaceflight at the new facility. The economic impact of launches, tourism and new construction at Spaceport America are already delivering on the promise of economic development to the people of New Mexico. Good work everyone! Glad to see that Spaceport America worked out better for Armadillo this time. Congrats to Armadillo and John Carmack.